Although California lost one of its iconic tunnel trees in the winter storms of 2017, there’s still plenty more in the state to enjoy. In fact you can see — and even drive through — three of these massive giants on a leisurely jaunt down Highway 101 and The Avenue of the Giants. Not only is the experience very accessible, but these kitschy roadside attractions also add a decidedly retro feel to any Northern California road trip. Located a quarter-mile off Highway 101, the Klamath Tour-Thru Tree is easy to find. Just take exit 769 (Tewar Valley), then turn east. The tree is just up the road on the left. Like all the drive-through trees, you pay an entrance fee at the kiosk and then follow the road and drive through the giant tree. Admission to the Klamath giant is $5 per car. It should be noted that it’s a pretty tight fit for most vehicles, as the tunnel is just 88 inches wide and 114 inches tall, so remember to turn in your mirrors if possible. The tree tunnel was completed in 1976, and the massive redwood is estimated to be 785 years old. It’s really a quick trip through the tunnel, but for another perspective on the tree, open your sun roof as you pass through. Additionally, it’s best to hit this drive-through tree early in the morning, as there isn’t much room near the tree and traffic can get pretty congested in the afternoon. 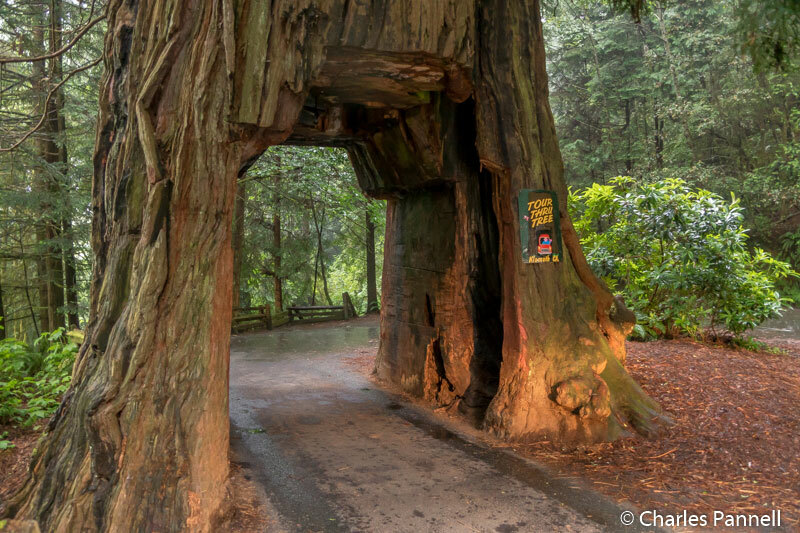 The next drive-through tree is located about 120 miles south, along the scenic Avenue of the Giants. Continue south on Highway 101, then take exit 674 in Pepperwood and turn left. Follow this scenic byway through the redwoods until you get to Myers Flat, where you’ll find the Shrine Tree on the right. 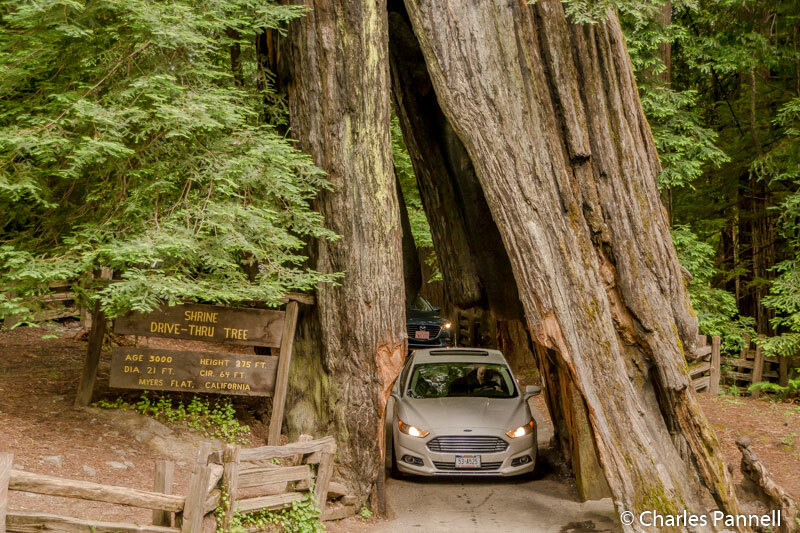 Admission to this tree is $8 per car, and this 3,000 year old redwood has an equally tight 91-inch wide clearance. Unlike the other drive-through trees though, the 175-foor tall Shrine Tree has a natural opening rather than a man-made one. And although the drive through the tree is short but sweet, there are also a few carvings in the park as well as a level picnic area. The final drive-through tree on the itinerary is located another 50 miles south in the town of Leggett. Follow the Avenue of the Giants until it ends on Highway 101, then continue south to Drive Through Tree Road and follow the signs to the Chandelier Tree (www.drivethrutree.com). The admission price to this tree is $5, and the fern lined drive to the 315-foot tall tree is filled with redwood planters. The tunnel was carved in the mid 1930s, and the tree is estimated to be 2,400 years old. It’s the nicest of the three trees, as there’s a large dirt parking area, and standard picnic tables on a level grassy area. There’s also a gift shop, but it’s really not doable for wheelers and slow walkers. Still, pack along a picnic and enjoy an outdoor repast in the shadow of the towering redwood. 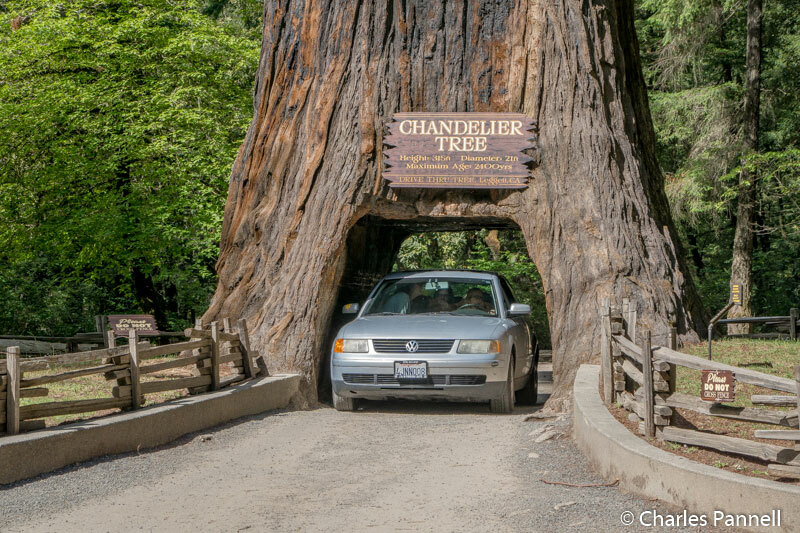 And truly, if you only have time for one drive-through experience, the Chandelier Tree is the best choice. Not only is there plenty of room near the tree for photos, but there’s also a large area to linger on and enjoy it all. ‹ Access in the Skies: Always Remember the CRO	› Volcanoes, Mud Pots and Steam Vents, Oh My!